David R. Inglis enjoyed a distinguished career in nuclear physics that ranged from theoretical work on the structure of the nucleus in the 1930s to the development of the atomic bomb in the 1940s and work on renewable energy in the 1960s and 1970s. A Professor of Physics at UMass from 1969-1975, Inglis was a founding member of the Federation of American Scientists and from the mid-1940s on, he dedicated himself to informing public policy on the dangers of nuclear technologies. The Inglis Papers offer a perspective on the life and career of a theoretical physicist who grew from an early involvement in the Manhattan Project to becoming a committed critic of nuclear weaponry and nuclear power. Although the collection is relatively sparse in unpublished scientific work, it includes valuable correspondence relating to Inglis's efforts with the Federation of American Scientists and other organizations to influence public policy on issues relating to disarmament and nuclear power. A namesake and descendent of David Rittenhouse, one of early America's preeminent physical scientists, David R. Inglis enjoyed a career in nuclear physics that ranged from theoretical work on the structure of the nucleus in the 1930s to the development of the atomic bomb in the 1940s to the protracted struggle against nuclear weaponry and nuclear power. Born in Detroit, Michigan, on October 10, 1905, Inglis graduated from Amherst College (1928) before receiving his doctorate from the University of Michigan in 1931 for a dissertation on energy relations in complex spectra. Like many ambitious young scientists of his generation, Inglis traveled abroad to strengthen his credentials. Well versed in current issues in the field from having attended the series of symposia on theoretical physics held in Ann Arbor, Inglis spent a year in Heidelberg, immersing himself in the rapidly developing field of quantum mechanics. When he returned to the States in 1933, however, he found himself in a state of academic vagabondage, passing through a succession of faculty positions at Ohio State (where he met and married Dorothy Kerr), Pittsburgh, and Princeton before landing at Johns Hopkins in 1938. There, he devoted himself to developing a program in experimental nuclear physics while conducting significant research on the nature of spin-orbit coupling in 7Li. When later confirmed, this work is believed, as Hanna et al. (1997) report, to represent the first assignment of an excited nuclear level based on a microscopic quantum mechanical theory. Inglis' tenure at Hopkins was interrupted by wartime service with the Ballistics Research Laboratory at Aberdeen Proving Grounds (1943) and the Manhattan Project at Los Alamos Laboratory, N.M. (1943-1946). He returned to civilian life in 1946 and to his work on atomic structure and angular distribution studies, but the war was clearly a watershed in the development of his commitment to what he called public affairs. Having gained an insider's perspective on nuclear annihilation, he gradually turned against nuclear power. Joining the Argonne National Laboratory as a senior scientist in 1949, Inglis spent two decades in the development of peaceful uses for nuclear power, but more notably, he emerged as a prominent figure in the nuclear disarmament movement. As a founding member of the Federation of American Scientists and participant in the Pugwash conferences during the 1950s and 1960s, Inglis was an prominent voice for rationality in discussions of nuclear weaponry. As early as 1951, he called for the creation of a federal agency for arms control and disarmament (not established for another nine years later), and both in congress and before the public, he lobbied steadily for nuclear disarmament and for a partial nuclear test ban (approved in 1963), and against nuclear proliferation and the development of antiballistic missiles. A series of articles he published in the Bulletin of the Atomic Scientists, Saturday Review, and the New Republic were influential in raising public awareness of the dire implications of radioactive fallout, the hydrogen bomb, and the complexities of international arms control. After retiring from Argonne and joining the faculty at UMass Amherst in 1969, Inglis' activism expanded to include a concern with American energy policy. Calling attention to the critical problems of global dependence on fossil fuels and the dubious safety of nuclear reactors and long-term waste storage, Inglis became an advocate for alternative energy, particularly wind power, writing several books and chapters on nuclear and alternative energy. He felt a strong responsibility, as he wrote, for establishing a dialogue between scientists and the public as the best means of preserving democracy. A highly prolific writer, Inglis contributed dozens of articles both in theoretical physics and public affairs over the course of his career, and was recipient of a number of honors and awards, including honorary degrees from Amherst College (1963) and the University of Illinois (1973), and the Leo Szilard Award for Physics in the Public Interest (1974) for his work on the social and strategic implications of nuclear energy. Inglis retired from UMass in 1975 and over the last several years of his life, continued occasionally to contribute to public debates. 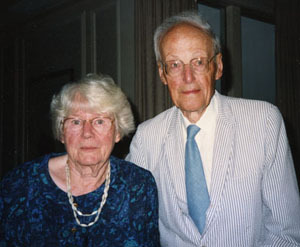 Inglis and his wife Betty (Dorothy) moved into the Applewood retirement community in September 1991. Betty died in 1993, followed by David died on December 3, 1995. The papers of David R. Inglis offer a perspective on the life and career of a theoretical physicist who grew from an early involvement in the Manhattan Project to becoming a committed critic of nuclear weaponry and nuclear power. Although the collection is relatively sparse in unpublished scientific work, it includes outstanding correspondence relating to Inglis's work with the Federation of American Scientists and other organizations, and his efforts to influence public policy on issues relating to nuclear power. The collection also includes the majority of Inglis' scientific publications and his published contributions on public affairs, as well as selected subject files, course notes, and lab notes. The later materials in the collection reflect Inglis's late-career work in alternative energy. Among the collection's highlights are copies of notes distributed at Los Alamos University in 1945-1946, including Teller and Konopinski on quantum mechanics and Schiff and Baroody on statistical mechanics; Inglis' notes from his work at Argonne National Laboratories; and a six part oral history conducted with Inglis in 1989, looking back at his career. Although the series contains few letters on purely scientific matters, Inglis's correspondence is a rich and valuable resource for study of the social and political turmoil afflicting the American nuclear physics community from the end of the Second World War to the early 1960s. With a distinctly liberal conscience, Inglis was deeply immersed in professional organizations responding to controversies over loyalty issues and security clearances during the early years of the Cold War, and beginning in the mid-1950s, he took a leading and -- at least for some co-workers at Argonne National Laboratory -- controversial role as an advocate for non-proliferation, disarmament, and a nuclear test ban. Of particular note, Inglis's correspondence contains an interesting and important series of letters documenting Inglis's work with the Federation of American Scientists from 1946-1960, and less extensive correspondence relating to his activities with the World Association of World Federalists and the World Federation of Scientific Workers. Founded in 1945 by scientists from the Manhattan Project, the FAS regularly addressed key issues in American public policy, especially with regard to the potential dangers of nuclear weaponry and other scientific and technical advances. The series also contains interesting correspondence relating to Inglis's lobbying efforts for nuclear disarmament, including letters to and from public officials from President Dwight Eisenhower to Senators Everett Dirksen, Hubert Humphrey, and Paul Douglas, and the editorial boards of several newspapers and magazines. Also worthy of note are letters and documents pertaining to the establishment of the Midwest Nuclear Theorists's Group and the Nuclear Theorists's Group at Argonne National Laboratory, and some correspondence relating to the possibility of siting nuclear reactors underground, including a fine letter from Edward Teller. Materials associated with Inglis, primarily during his . Inglis' increasing interest in disarmament is reflected in SIPRI. The series also includes correspondence from Inglis' publishers regarding his book Nuclear Energy Its Physics and Social Challenge (including some interesting reviewers' comments on the manuscript), from the editors at Encyclopedia Britannica regarding his entry on the atomic nucleus, and drafts and notes on several of his articles on disarmament and related topics. The materials relating to Inglis' involvement in two UMass Amherst initiatives -- the Global Survival Program (1972-1973) and the review committee for the Institute for Man and His Environment (1971-1974) -- offer some insight into faculty efforts during the early 1970s. Finally, the series includes a useful series of spiral-bound research notes kept by Inglis during his period at the Argonne National Laboratory (1955-1968) and as a visiting scientist at CERN (1957-1959). Mimeograph and other copies of notes distributed for courses attended by Inglis on topics in nuclear physics. Of particular interest are notes from two courses taken at "Los Alamos University," formed by Hans Bethe and Enrico Fermi during the last days of the Manhattan Project: Teller and Konopinski's "Introduction to Quantum mechanics" and Schiff and Baroody's "Statistical Mechanics." Reprints of technical and "public affairs" articles by Inglis from throughout his career. The articles, mostly reprints and offprints, are filed alphabetically by title. In 1989, Inglis agreed to take part in an extensive series of oral history interviews, discussing his perspective on the history of nuclear physics since the 1920s, with particular focus on the development of nuclear weaponry and nuclear power. The videotapes have been transcribed (see Ser. 1: Oral History) and edited. The series also includes a dvd of Inglis lecturing to Allan R. Hoffman's undergraduate, non-major course at UMass on energy and arms control, where he discusses the Manhattan Project and the atomic bombing of Japan. Letters between Allison (Univ. of Chicago) and Louis A. Turner (Argonne) re: Robert Oppenheimer case and the upcoming International Conference. William Davidon plans a summer study on international arms control. Includes draft of "An appeal to President Eisenhower" and press release regarding Formosa Straits crisis. Re: international nuclear test ban. Includes copy of "Policies for a Nuclear Future" (press release from Sen. Anderson's remarks) and "Statement of Senator Clinton P. Anderson on Russian Test Ban Proposal." Correspondence and memos regarding organization of the group, including 2 TLsS from Eugene Wigner, TLS from Aage Bohr, Akito Arima, Arthur K. Kerman, and Richard Ferrell. Includes "Policy guide for atomic education." Offprint of article, "On responsibility of scientists," signed by Bloch. Letter to Bohr on summer plans. Statement before the Senate Subcommittee on Disarmament. Re: Institute for Defense Analyses. See also National Committee on a Sane Nuclear Policy. Letter to the editor re: nuclear test ban. Re: International Nuclear Physics Conference. Re: writing an editorial on nuclear policy in the Chicago Daily News. Statement of support concerning Condon in obtaining security clearance. Correspondence, programs, and other organizational material relating to scientific conferences. Includes letter to Senate Subcommittee on Disarmament, Statement by 18 German Physicists Barring Work on Nuclear Weapons (1957); Dept. of State Press Release re: Soviet experts in Geneva (1959); "A scientific approach to the disarmament problem," Address delivered by M. Mooney at a luncheon of the Society of Rheology, 1959; Recommendations from a Conference to Plan a Strategy for Peace, Arden House, 1960. Press releases from White House Disarmament Staff. Disarmament (from Federation of American Scientists). Re: Hans Bethe and prospect of a fission-free bomb. Press release from the White House on the detection and identification of underground nuclear tests. Includes notes on the Fourth Country Problem. Re: issues over loyalty, House Un-American Activities Committee, the atomic bomb, and some organizational information on Baltimore chapter of FAS. Much on civilian vs military control of the atomic bombs; loyalty problems and clearance, the E.U. Condon case; Scientists Committee on Loyalty Problems; House Un-American Activities Committee. E.U. Condon case; McCarthy; House Un-American Activities Committee. 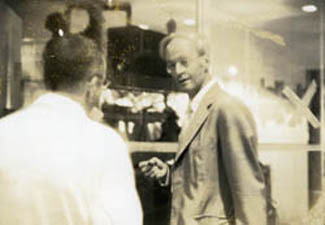 Correspondence with and about Hellund, a colleague imprisoned on an unspecified morals charge seeking Inglis's help finding a position as theoretical physicist. Correspondence (to Humphrey) and press releases relating to disarmament and test ban. Includes photocopy of Freeman Dyson's "Future development of nuclear weapons." Inglis, David R.: Test-ban Agreement or Resumption of Tests? Invitation to join the Consumers Union Board, which is likely to be targeted by the Thomas Committee. Includes a copy of Laucks' pamphlet, Preparedness for Peace: Proposal for a First Step. Includes memo from J. Robert Oppenheimer of future of Los Alamos (1945). Notes on recollections of Mayer. Correspondence and organizational materials for Nuclear Theorists' Group; records of meetings; correspondence with George Volkoff. Includes letter of reprimand to Inglis for Strauss' nomination before the Senate Commerce Committee. Post-War World Council and National Committee for a Sane Nuclear Policy are organizing public hearings on the meaning of war in a nuclear age. Correspondence and notes relating to siting nuclear reactors underground. Includes 2p. TLS from Edward Teller. Regarding Inglis' article "Nucleus, Atomic." Short and long versions of "Nucleus, Atomic." Correspondence and memos relating to Fall faculty colloquium, 1972, and Global Survival Program. Includes: Carl A. Carlozzi, "Resources and People;" Leon Clark, "Population education;" Leon Clark, "World population;" David R. Inglis, "Alternatives to the Arms Race with its Risk of Nuclear War;" David R. Inglis, "Nuclear Weapons Control on the Way to Disarmament;" Betty G. Lall, "A Comprehensive Nuclear Test Ban Treaty." Notes, background material, correspondence relating to IMHE. Printed background materials for use by members of the Review Committee. Published proceedings, with preprint of Enrico Fermi, "High Energy Nuclear Events." Article submitted for publication ("Test ban hopes and handicaps") and request from editor Gil Harrison for comments on "The meaning of moving forward." Published articles on nuclear reactor safety. See also Papers: "Database and the conclusion of WASH 1400"
Interviewers: Roy Cook, Ted Harrison, Francis Pichanick, Monroe Rabin, Janice Shafer, Morton Sternheim. O'Sullivan, T. C.: But what if nobody cheats? Outline (for article?) on recent disarmament talks. Brief paper on disarmament talks in Geneva. Correspondence, rough draft, and final draft relating to Inglis' contribution to Hans Frauenfelder's book, The Mossbauer Effect. Includes Inglis' article, "Resonance radiation of nuclei bound in a lattice," and Harry J. Lipkin, "Some sunoke features of the Mossbauer Effect." Includes drafts, notes, and correspondence of article written with Murray Peshkin. Includes obituaries, curriculum vita, news clippings, and photograph. Includes correspondence with Richard L. Garwin, et al., photograph. Correspondence, Agenda, and papers for symposium held in Tallberg, Seden, June 15-18, 1973. Revised version of paper presented at Pugwash Symposium, 1968. Re: balance in coverage of disarmament in Readers Digest. Paper presented at 4th International Conference on Peaceful Uses of Atomic Energy, Geneva, 6-16 Sept. 1971. Publications: "'No-cities attacks' or disarmament?" For transcripts, see Ser. 1: Oral History. Interviewers: Roy Cook, Ted Harrison, Francis Pichanick, Monroe Rabin, Janice Shafer, Morton Sternheim. Allan R. Hoffman, a young physics professor at UMass Amherst, invited Inglis to lecture to his undergraduate, non-major course on energy and arms control. Gift of Allan R. Hoffman, 2007. Acquired from David R. Inglis, 1984, 1994. Six videotaped oral histories of Inglis have been digitized and are available online through Credo, SCUA's digital repository. Hanna, Stanley S., Dieter Kurath, and Gerald A. Peterson, "David Rittenhouse Inglis," Physics Today 50, 6 (1997): 109-110. David Rittenhouse Inglis Papers (FS 033). Special Collections and University Archives, University of Massachusetts Amherst Libraries. University of Massachusetts Amherst. Department of Physics. University of Massachusetts Amherst. Institute for Man and His Environment. World Association of World Federalists. World Federation of Scientific Workers.